Creationists can find much to agree with on both sides of this fiery evolutionary tussle. There’ a war on, we’re told, among evolutionists researching man’ origins; a fierce debate in which, it is claimed, one side has to be completely right and the other completely wrong—no middle ground. In the one camp are those (mainly, but not exclusively, geneticists) who claim that all modern humans have descended from one small population in Africa and spread across the globe, replacing or wiping out whatever other ‘archaic’ humans (for example, Neanderthals) may have been living at that time. This idea is variously called the ‘Out of Africa’ or ‘Garden of Eden’ hypothesis—it came about primarily because of the evidence for a ‘mitochondrial Eve’. Let’ call the camp holding this view A for Africa. It says that of all the various ancient types of (or leading up to) man, including Homo erectus, only one line survived.1 This was a small African population living around 200,000 years ago (to an evolutionist, that’ only yesterday). Their African Eve’ who is the ‘mother of us all’ would have been part of this population. All the racial characteristics of today’ Eskimos, Indians, Aborigines, Europeans and so forth were all essentially present in that small group before it broke up and spread across the earth. The mitochondrial DNA evidence, viewed within an evolutionary scenario, would also suggest that they did not interbreed with any of these other so-called ‘archaic’ peoples which, according to evolutionary theory, had already been in other parts of the world for a long time. Instead, they totally replaced them. That is why this hypothetical group of people have been somewhat disparagingly called the ‘killer Africans’. According to the opposing camp (call it B for bone), it seems beyond belief that this would have happened in all areas of the world. They point out that such total conquest, with no intermarriage, has never happened in human history. These opponents to the African replacement theory (mostly students of fossil bones) have a different idea, called the ‘candelabra theory’. This is a much more traditional belief, one which claims that the separation of the different races of people happened a much longer time ago, and that the various races evolved their differences because of these long periods of isolation. This, of course, has often been used to justify racist ideas—other races supposedly being at ‘different stages of evolution’ to one’ own. The reason these ‘bone men’ cling so strongly to this view, and will not let it go whatever the ‘test-tube men’ might say, seems to be that they can demonstrate similarities between the skeletons of modern people in a particular region and those of the more ancient people in that region which they are supposed to have replaced. In other words, camp B says that ‘archaic’ skulls found in, for example, China, have features characteristic of modern Chinese. Similarly, ‘early’ skulls found in, for example, Java, have features which are closer to Australian Aborigines than to Chinese, and so forth. If modern people totally replaced these ‘ancient’ people, then such resemblances would be an incredible coincidence, they say. Is it true, then, that one of these ideas is totally right or wrong? That you have to throw out either the molecular or the bony evidence? Only if the question is viewed in an evolutionary framework. A biblical, creation-based anthropology seems to have great potential for accommodating both sets of evidence. Let’ put it simply—beginning with the Bible’ account of the origin and history of man, what would we expect to find? 1. That all mankind has descended from one woman (Genesis 3:20). Here we agree with this particular conclusion of camp A. No matter how evolutionists are able to fit the ‘mitochondrial DNA’ evidence into an evolutionary framework, it was an unexpected result; a direct prediction, however, from creation. 2. That this was not very long ago (Luke 3:23–38). Camp A says (on the basis of the ‘molecular clock’ hypothesis, which ‘calibrates’ the rate of mutational change in DNA replacements against assumed evolutionary chronologies) that the time was around 200,000 years ago. Camp B, which as we have seen is able to point to a number of skulls with anatomical similarities to modern humans in the same part of the world, is faced with the fact that they have already dated many of these skulls as much earlier. Since they would insist that any common mitochondrial ancestor of today’ humans must have been the ancestor female to all these earlier skulls as well, they cannot accept such a ‘recent’ date for common ancestry. So of course they say that camp A’ molecular clock is running at the wrong rate. We can agree with camp B on that point—only in the other direction. We can agree with camp A that Eve was recent—only much more recent than they would consider. 3. That all races of people are very closely related genetically (Acts 17:26). 4. That the racial characteristics of modern humans did not evolve in isolation from each other, but were present in one small population before it spread across the earth (Genesis 11:6–9). How do those regional similarities between ancient and modern skulls fit into a biblical model? As subgroups of this original population spread across the earth, the differences between them were basically because they carried different fractions of the same original gene pool at Babel. In any particular area (for example, China or Australia and its near neighbours) there would also have been a range of variation among such a daughter population—some genetic, some environmental. The point is that one would expect a closer degree of genetic similarity in a given region. Many of the experts in camp B point out that some of these characteristic archaic features can be found in modem human skulls. By showing some shared unique traits between Neanderthal and modern European skulls, for instance, they wish to show local evolutionary descent and thus refute the camp A hypothesis; we would state that it does indeed demonstrate relationship, as expected. African Eve or biblical Eve? Inside every cell of a human body is a stretch of DNA which is only inherited from one’ mother. Unlike ordinary DNA, which takes part in the transfer of hereditary information, it is not found in the nucleus (centre) of a cell but in a little ‘energy factory’ in the outer parts of the cell called the mitochondrion. Copying mistakes (mutations) in this DNA are not likely to be lethal (and thus quickly eliminated), so they can accumulate at a faster rate than ordinary DNA. So if the various races of men alive today were separated by vast periods during which they evolved separately, they would have quite different DNA ‘fingerprints’ in the mitochondria of their cells. Analyzing samples of mitochondrial DNA from large numbers of all the different races on Earth showed that there was a surprising (to evolutionists) degree of relatedness—in fact, the differences that were found could be accommodated by postulating one woman as the common ancestor of all the mitochondrial DNA sequences found on Earth. Note that this does not mean that evolutionists believe that only one woman existed at that time. Only that this was the only one to have transmitted her mitochondrial DNA to an the people living on earth today. Think of the way in which a surname in our society is only inherited from the father. Now imagine an island whose inhabitants had only three surnames: Smith, Jones and Watson. Any particular name can become ‘extinct’ (if all the descendants in one generation are female only) even though that generation still has offspring. In due course, it is not at all unlikely that all the inhabitants will come to carry the same surname. This happened in the case of Pitcairn Island in the South Pacific with the descendants of the Bounty mutineers in 1790. Mitochondrial DNA ‘surnames’ can become ‘extinct’ in the same way. In fact, with a small population of females to begin with (that is, a small number of ‘surnames’), it is a likely occurrence. Now imagine if the island population mentioned above has already broken into two groups, each with all three surnames. Smith may ultimately become the sole surviving surname within one isolated group, Jones on the next. However, if the inhabitants of the one island, after being reduced to one surname, spread out across an empty Earth, all populations will carry that name. If they have already separated into several groups for a significant time before such a wide dispersion, then there is likely to be more than one surname present today. Having only one mitochondrial ‘surname’ surviving in all the races of man means either that (a) there really was only one woman at the beginning of a very recent origin of humanity—the biblical Eve, or that (b) all the other ‘surnames’ have become extinct. However, as we have seen from our island/surname example, this would seem to mean accepting that all the races existed as a single small population long after man is supposed to have first evolved. In other words, in escaping the biblical implications of ‘Eve’ (by regarding her as one woman among many living in Africa 200,000 years ago) evolutionists must accept a scenario which in broad outline strongly parallels the Babel account. For this reason, it is sometimes also called the ‘Noah’ Ark’ theory. For further reading, see Christopher B. Stringer, ‘The Emergence of Modern Humans’, Scientific American, 263(6):68–74, December 1990. M.H. Brown, The Search for Eve, Harper & Row, New York 1990. Alan Thorne, Milford Wolpoff, ‘Conflict Over Human Origins’, Search, 22(5):175, July–August 1991. See also by the same authors, ‘The Case Against Eve’, New Scientist, June 22, 1991, pp. 33–37. 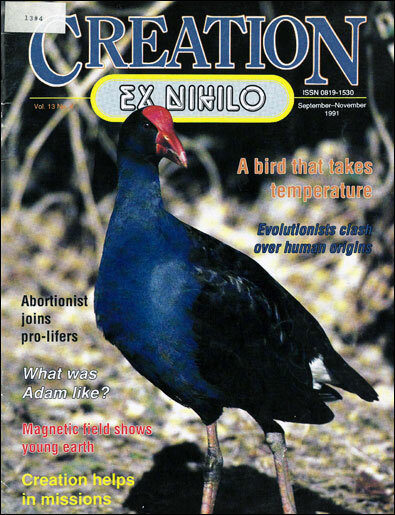 Ken Ham, Andrew Snelling, Carl Wieland, The Answers Book [see revised edition], Creation Science Foundation, Sunnybank (Queensland, Australia), 1990, pp. 83–100. Science News, 139:360–363, June 8, 1991. ‘Neanderthal’ Disappearing Act’ shows that in Israeli caves, obvious ‘Neanderthal’ bones exist with and in some cases after anatomically ‘modern’ humans. The classification is complicated by the fact that the various skeletal features are individually distributed among various specimens. Baruch Arensburg of Tel Aviv University is quoted as saying ‘you can classify any individual fossil in the Israeli caves any way you want’ (i.e. Neanderthal or modern). This highlights the blurred boundries between Neanderthal and ‘modern’ features. Milford Wolpoff is quoted as saying that these Israeli fossils are ‘one big anatomically variable population’. This suggestion was raised from palaeontological considerations in a lecture, ‘Am I a Monkey’ Nephew?’ by Dr Kurt Wise (Ph.D. Harvard, paleontology) at Creation Science Foundation’ 1990 Summer Institute in Sydney, Australia. Owing to the extremely fragmentary nature of some of the evidence, we cannot assume that all specimens thus labelled can be regarded in this same way. A fruitful, though tedious area for a start would be a detailed survey (radiographic or post-mortem) of present day human skeletal (at least skull) features. The biblical model would be reinforced by showing many, if not all, the characteristics of erectus and Neanderthal (though probably in isolation from one another) to be present among the range of variation in modern humans.